The reefs around El Gouna are spectacular with many only a 15 minute boat ride from the resort. Home to the Oceans Red Sea Dolphin spotting trip, El Gouna offers an exciting choice of excursions. To make things easy for you, we offer a complimentary pick-up and drop off service from all the hotels. 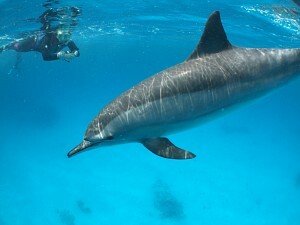 This is our most popular trip, taking small groups aboard our fast boat to view the wild dolphins of the Red Sea! What better way to encounter these fantastic marine mammals than in their own environment? After a thorough safety briefing, you'll set off to explore the area looking out for dolphins along the way. As soon as we encounter these fantastic animals and, providing it's safe, it's your opportunity to get into the water and spend some time with them. Time permitting, after your dolphin experience, we zoom off to another reef to explore and encounter many of the other wonders of the Red Sea. These are wild dolphins who roam these areas of the Red Sea, therefore sightings can't be guaranteed but we have over 90% success to date. Price includes dolphin encounter (not guaranteed), bottled water, equipment, PADI/SSI qualified guide and taxes. Please note, due to the speed and nature of the boat, this trip isn't suitable for children under 10 years old. We offer a complimentary pick-up and drop off service from all the hotels. Swim, snorkel or simply relax and enjoy time out with family and friends. Sit back, relax and go with the flow. A freshly prepared lunch on board is provided. Time: Leave 08.00 / Return 16.30 - 17.30 approx. This trip runs every day. The Mini B Experience is possible on this trip for 20 GBP/25 Euro extra. Price includes hotel pick-up, lunch, bottled water/soft drinks, fish ID card, equipment and taxes.